IRNA – Tehran’s Interim Friday Prayer Leader Ayatollah Ahmad Khatami said the recent terrorist attack in New Zealand against Muslim worshippers was the outcome of West’s long years of Islomophobia. Terrorist mass shooting at two mosques in New Zealand on March 15 left at least 50 worshippers killed. 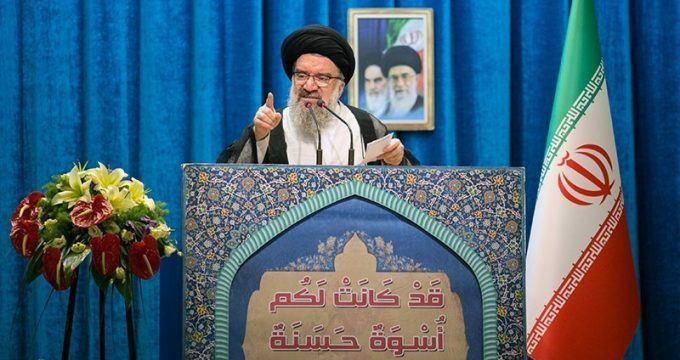 Addressing a large crowd of worshippers in the Iranian capital on Friday, Ayatollah Khatami noted that three points have to be taken into account about New Zealand shooting. The first point is that the culprit of the crime openly says he is a racist and is in the same line of thought with US President Donald Trump, the Ayatollah said, adding that the cause of this crime was West’s long years of Islamophobia. With regard to the second point, Ayatollah Khatami noted that the West did not even accept to call the incident “a terrorist operation”, rather called it “an armed attack”. “It means that if a Muslim is killed, it’s not terror, but if a cat or dog of theirs is hurt, it is an act of terrorism,” the Ayatollah said. Ayatollah Khatami also said that the third point about New Zealand attack is that the West’s pressure against Iran is not just limited to Iran. He argued that the Westerners have rather targeted Islam and so the Muslims should stand firmly and actively against them.